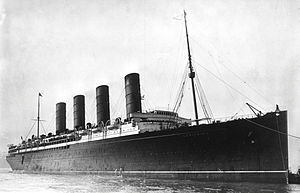 On 7th May, 1915 the Royal Mail Ship Lusitania, a Cunard Line passenger liner was sailing along the southern Irish coast on her way to Liverpool from New York, when she was torpedoed by the German Submarine U20. Within 18 minutes the ship had sunk. Of the 1,962 passengers and crew only 764 survived. There was international protest at the sinking of a passenger ship but the Germans argued that she was a legitimate target because she was carrying munitions to England. Over 100 Americans were killed and this helped shift public opinion in the United States regarding the war.